Jesus takes a basin of water and begins to wash the disciples' feet. WO DISCIPLES, PETER and John, were hurrying along the road from Bethany to Jerusalem. They were going on an errand for their master. The day had come when the lamb for the Passover Feast should be killed, and Jesus had chosen these two disciples to go to Jerusalem and prepare the feast that the Twelve should eat with him that evening. After they had passed through the city gate, they looked about to find a man carrying a pitcher of water. Men seldom carried water-pitchers in the streets, for such work was usually left for women to do. But Jesus had told them they would see a man carrying a water-pitcher, and they did. Jesus also told them to follow the man to the house where he should go with his pitcher, so they followed. At the house they met the owner, and to him they gave the message that Jesus had sent. This was the message: "Our master sent us to ask your permission for him to use your guest-room in which to eat the Passover supper with his disciples." And the owner of the house led them to a nice room up-stairs which was furnished with a table and couches on which the guests might recline while they ate. No doubt this owner knew Jesus and was glad to give him the use of the guest-room in his home. When evening came, Jesus and the other ten joined Peter and John and together they sat around the table in that quiet room upstairs. A feeling of sadness crept into the hearts of the disciples, for their Master spoke to them so earnestly about going away soon. It was so hard for these men to believe that Jesus would really be taken away from them. They had seen him do such wonderful things that it seemed impossible to think men could ever kill him. And soon they were talking about other matters at the supper-table. Some were wondering who would be the greatest in the kingdom that they expected Jesus to set up soon. Jesus knew their thoughts, and he wished to teach them more about the kind of kingdom he was bringing to mankind. He rose up suddenly from the table, laid aside his outer garment, and tied a towel about his waits. Then he took a basin of water and began to wash the disciples' feet. The disciples looked at each other in silent astonishment. They could not understand why he should be doing this humble act of service, for they had washed the dust from their feet before coming into that upper room. Finally Jesus came to Peter with his basin. But that disciple pulled his feet away, and exclaimed, "Lord, you shall never wash my feet!" "Then," answered Jesus calmly, "you shall never had a part in my kingdom." At this Peter changed his mind suddenly, and he said, "Lord, you may wash my feet, and even my hands and my head." Very desirous was this disciple of having a part in Jesus' kingdom. But by washing their feet, Jesus did not mean in this way to prepare the hearts of his disciples for his work. He said to them,, "You are clean already, but not all." For he knew which one was not a true disciple. When the strange washing was over, Jesus laid aside the towel and took up his garment again. Then he returned to his place at the table, beside John, and began to explain to his disciples what he had just done to them: "You call me Lord, and Master," said he, "and so I am. 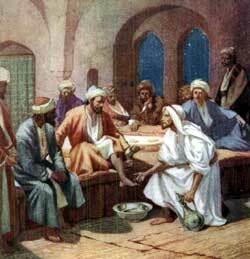 If I, your Lord and Master, have washed your feet, you ought to wash one another's feet. For I have given you an example that you should do to each other as I have done to you. The servant is not greater than his master, and if you would be good servants you will obey my words. If you know my commands, you will be happy when you obey them." Jesus also said that one of them should give him into the hands of his enemies, who would take his life. This seemed hard to believe, but the disciples knew Jesus' words of prophecy always came true, so they were amazed. Instead of looking at each other accusingly, each man thought of himself. And each one said, "Lord, is it I?" John, the disciple who liked to be near Jesus, was reclining next to his master at the supper. Peter motioned to John and whispered, ""Ask which one will do this dreadful deed." So John asked Jesus, and Jesus replied in low tones, "The one to whom I shall give a piece of bread when I have dipped it in the dish." John watched carefully, and soon he saw Jesus give a piece of bread to Judas Iscariot. After Judas had taken the bread that Jesus gave to him, Jesus said, "That thou doest, do quickly." Then the desire in his heart to get rid of this master became stronger, and Judas hurried out of the room into the gloom of night. None of the disciples understood what Jesus meant, but they supposed because Judas carried the money-bag that he was going to do something for their master. Jesus then, after supper, took bread and blessed it and broke it in pieces, giving parts to each of the disciples, and saying, "Take this bread and eat it, for it is my body which is broken for you." Then he took the cup and when he had given thanks he passed it to them, saying, "Drink this, for it is my blood, which is shed for you, for I will never again drink of the fruit of the vine with you until that day when I drink it new in the kingdom of God." They lingered a while longer in the upper room, and Jesus talked earnestly to them about the time when he should go away and leave them alone. He urged them to remember his commandment to love each other as he had loved them, and he told them that he would prepare a place for them in his Father's house. Peter insisted that he would not leave Jesus, but would go with him wherever he went. Jesus told him that he could not go now, but that he might come later on. He also told Peter that, bold as he believed himself to be, he would prove himself a coward before daylight should return, for he would forsake Jesus and even deny that he had ever know him. Thus the Lord's Supper had been instituted. Then Jesus and his disciples sang a hymn together, and quietly left the upper room, going out of Jerusalem into a garden nearby.